I've been working out at the Cupertino branch of Mona Khan Company since April 2011. I am 44 years young and my only regret is that I did not sign up earlier. Every time I go there, I get an amazing workout and I absolutely love it. 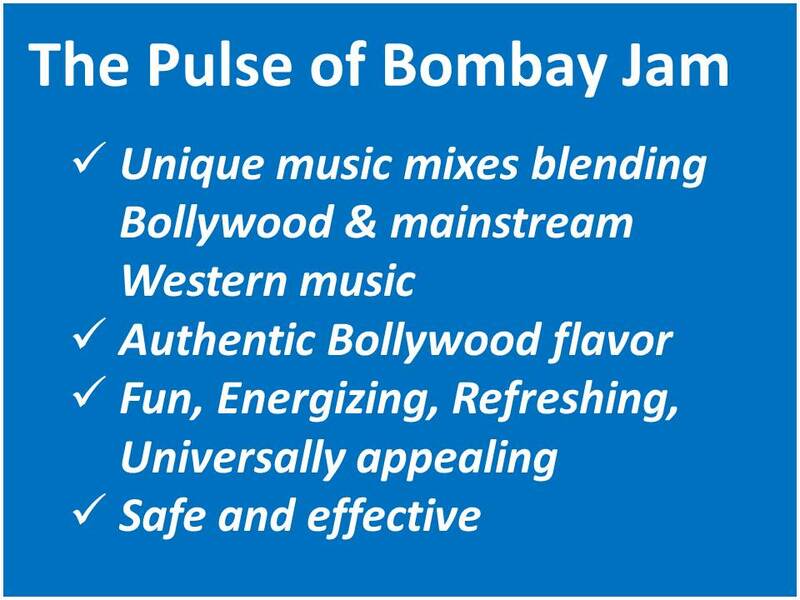 Fun and fitness – Bombay Jam® achieves both. Mona Khan Company, the Bay Area’s leading Bollywood Dance and Fitness Company brings the flavors of Bollywood dance to your workout routine. Powered by the explosively fun, globally appealing Bollywood culture, Bombay Jam® is the ultimate dance fitness total body workout that is effective, safe, easy to follow and packed with authentic Bollywood moves! The creators of the program have worked with certified fitness professionals to ensure the safety and effectiveness of the program. Watch Bombay Jam® in action. The first Bombay Jam® Certification training is on Sunday, March 25th, 2012 at Club Sport Fremont. The fitness industry's only structured Bollywood program is now available to anyone who is looking for an incredibly fun, unique and fresh workout to teach at a studio or gym. You can be the answer to the huge demand in the market today for Bollywood fitness. Mona Khan Company is recognized by AFAA as a Continued Education Provider. AFAA instructors will earn 5 CEUs after successful completion of the Bombay Jam® Certification training program. Bombay Jam® incorporates cardio and toning routines into one action packed total body workout, and routines are set to custom music mixes created by Bombay’s hottest DJs. The music is a blend of Bollywood and mainstream Western Top 40 tracks, resulting in one-of-a-kind mixes that are refreshing, energizing and universally appealing. The cardio routines incorporate basic, easy to follow dance fitness moves full of Bollywood flare, and the toning segment focuses on sculpting long, lean muscle. In just an hour-long class, you can burn hundreds of calories and you will be counting down till your next Bombay Jam® class! Novices and fitness veterans alike are welcome in Bombay Jam® - intensity can be easily modified to match the individual’s fitness level. About Mona Khan Company: Headquartered in Sunnyvale, CA, Mona Khan Company offers Bollywood workshops, dance and fitness classes in various locations throughout the Bay Area. The company is a leader in providing the best of Bollywood style entertainment through its classes and its elite team of professional dancers. Bombay Jam® is Mona Khan Company’s Bollywood dance fitness total body workout. For more information, please email or visit Mona Khan Company’s website.